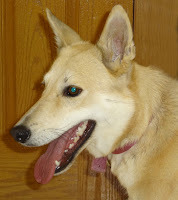 Female Shepherd mix, found at the Grant Street Apartments (near the High School) in Stanley. She has a short-haired coat that's light beige in color. She's extremely sweet and affectionate and would like to get back to her family!